The Crest family of companies include CrestREO, CrestLossMit, Century 21 Crest, Capital Lending Corp., and Escrow Time, Inc. Together they comprise a strategic cluster of real estate business operations under the same ownership, known as EAM Enterprises. Ray Mirzakhanian founded these companies, beginning in 1991, and continues to serve as their president. 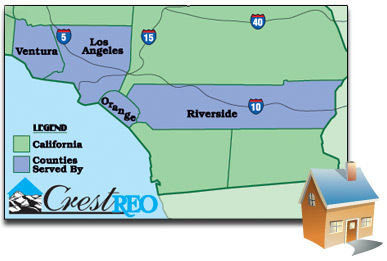 CrestREO provides comprehensive residential and commercial property management, marketing, financing, affordable housing redevelopment, homeownership counseling and outreach, and transaction closing expertise that is second to none in the greater Los Angeles and Southern California communities. CrestREO Loss Mitigation services help preserve homeownership. To prevent foreclosures, CrestLossMit offers unique in-person services to lenders and borrowers to restore communications and intervene in default situations. This vital service is available in many areas beyond California. Please look closely at the CrestREO Loss Mitigation brochure or read more under "Services" on this web site.